AdVini is a ‘family’ of wine brands and estates that criss-crosses famous French appellations including Laroche in Chablis and Cazes in the Roussillon. Another of the family is Ogier of the Rhône Valley, based in the centre of Châteauneuf-du-Pape but making highly-regarded wines from Crozes-Hermitage, Côtes-du-Rhône and other appellations too. Galets Roulés – rolled pebbles carried into the vineyards by glaciers with a rounded, polished character. The roots of the vines can go up to five metres deep, and the pebbles absorb heat which is released at night. Safres – a soil composed of compressed fine sand. It has evolved from marine sediment, with no stony pebbles and low in limestone. It is said to be a soil that drains very well. Grès Rouges – red sandstone, iron-rich with sand, gravel, pebbles and sea shells from marine sediment. Retains water but at the same time it drains well. Eclats Calcaires – formed from porous limestone. A relatively shallow soil, the roots do not go deep, but obtain water from cracks and fissures in the crumbling rock. I sampled two of the wines from the first (2009) release. It appears these wines are no longer available, the small production of just 6,800 bottles having been snapped up. Retailers were Berry Bros & Rudd and Fine + Rare Wines, and I am pretty certain those two retailers will carry the 2010 releases which should arrive soon. This comes from Châteauneuf-du-Pape vineyards based on Galets Roulés, the large, round ‘pudding stones’ found in this area. The blend is 65% Grenache, 15% Syrah, 10% Mourvèdre and 10% Cinsault. It has a deep and sonorous nose, lots of gloss and weight to the red and black berry fruit, velvety and inviting, just delicate spice and floral notes fleeting in and out. On the palate this is muscular, dense and meaty, with savoury spice and leathery notes and very grippy tannins. It’s a big, powerhouse of a wine that needs time to soften in bottle – maybe five years or more. 91/100. ‘Safres’ is sand, another of the soil types found in the Châteauneuf-du-Pape area and the source of the grapes for this ‘terroir’ designated wine. The soil derives from marine sediment and lacks the stones and pebbles of so many Châteauneuf vineyards. The nose seems a little brighter, more cherry-scented, fragrant and juicy than the Galets Roulés bottling, with a light gamy character too adding some complexity. On the palate that juicy character, along with spice and a crispness to the fruit and real mineral quality to the acids makes this feel much more agile. It also defies the 15% ABV, and although there is chocolate and spice to the finish, the fine tannins and racier fruit quality are just lovely. 94/100. 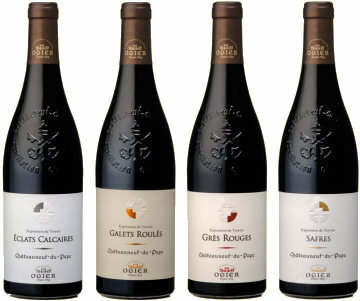 See all stockists of Ogier wines on wine-searcher.